Today we review Invincible Scars Scar Cream. With this special formula, your scars and dark spots will fade and soften on your skin. Formulated to also work well as a facial primer, this can replace one of your daily makeup steps! With only three ingredients, this supplement has many proven skincare ingredients missing. Nutrients like aloe vera lavender and palmarosa work wonders on your skin and help scars fade much faster. This lotion needs to be massaged into a healed wound 2-3 times daily. It does not say exactly how much should be used for each application. Additionally, it takes at least 12 weeks of consistent, daily application before you will see results. If you are wanting fast results to get rid of your scars or other marks on you skin, this is not the right choice for you. While no side effects are listed for this product, many customers had negative experiences. After using this product for an extended period of time, customers reported what seemed like chemical burns on their skin. Others started to break out within days of beginning this treatment. Each bottle of this cream only contains 0.9 fluid ounces. According to customer reviews, this amount only lasts a few weeks to one month at most. The manufacturer does not sell this product directly to consumers, but instead sells its products through Amazon. One bottle costs $28.99, but you can save 5% by subscribing to their auto-shipment program. For a product that does not even last for a month, this is quite expensive, not to mention it can take three months before you will see results. Not only does this manufacturer not offer a manufacturer’s guarantee, it is clearly stated that this item is not eligible to be returned at all. Customers even stated that there used to be a 30 day guarantee, but it was discontinued. Even with 30 days, that did not give customers the full 12 weeks to try the cream to see if it worked. With the guarantee being taken away, it shows that the manufacturer does not stand behind their product and is not committed to customer satisfaction. 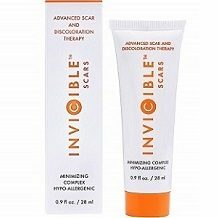 There are a few things we liked about Invincible Scars Scar Cream. This lotion is formulated to also work as a primer, so you can use it along with your daily makeup routine. Also, there is a 5% discount available to help bring the cost of this product down. Unfortunately, there are many negative traits about this product. First of all, the ingredient list is lacking many important skin care nutrients. Second of all, the dosing instructions state that you must use this cream 2-3 times per day for a minimum of three months before seeing results. Next, customers reported many unwanted side effects like breakouts and chemical burns. Also, even with the discount, this product is extremely expensive and one tube does not last for even one month. Lastly, the short guarantee that once covered this product has been stripped away, giving you no way to return this product for a refund. 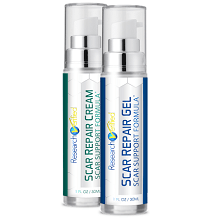 For these reasons, we cannot recommend this lotion to help you reduce the look of your scars.